Meanwhile, Marc Davis (left) continued creating hundreds of sketches, drawings and paintings as he developed scenes for the ride. "They were excavating [for New Orleans Square], so I went to work on ideas for a walk-through attraction," he recalled. By previously discussing the Audio-Animatronics and the transportation system Arrow developed, we are really getting ahead of the story. POTC was an idea being worked on as early as the late '50s, soon after Disneyland proved itself a popular success. When Walt first considered expanding the park to include a New-Orleans-themed section, the Pirates attraction was considered as a walk-through exhibit beneath the New Orleans streets; a sort-of glorified wax museum in the bowels of the bayou, you could say. 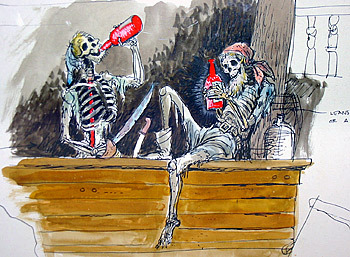 Many of Walt's finest artists and designers worked on the Pirates of the Caribbean attraction, though Marc Davis was heavily responsible for the characters and gags employed throughout the ride, basing some of his early works on art by famed pirate artist H.C. Pyle. 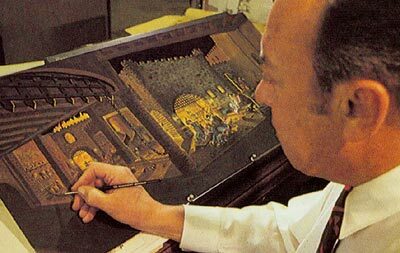 Above, Davis is pictured painting a detailed scene from the attraction in its early stages of design. Early on, the walk-through Pirates attraction was to feature scenes of famous pirates from history, and Davis worked on many illustrations to this extent. However, after the success of the WED Audio-Animatronic designs at the '64 World's Fair discussed above, the company was inspired to push the technological envelope and create robots that could imitate living beings. The proposed attraction was rethought, and the idea to provide a ride-through exhibit that immersed the viewer in the action (rather than display rather static displays) was embraced, and a storyline was developed to follow this idea. The pirate characters were first designed as sketches and cartoons, and their actions were illustrated on storyboards. 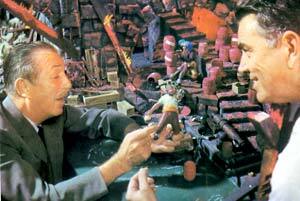 As this was being completed, a scale model of the attraction was also being built, with 9-inch characters. The "auction" scene, now one of the attraction's showpieces, was actually a late addition to the attraction. In the two illustrations above, you can see an example of a sketched scene of the auction (which was developed after the initial ride scenes had already been determined) and the clay maquette version, which was used to determine exact positioning. Note the incredible detail evident in even preliminary models. Also note how closely the actual ride's layout matches the conceptual sketch. Walt Disney himself "cast" the roles of the pirates to live actors and workers whom the WED engineers would replicate in clay to create the full-sized pirates and buccaneers. The actors would perform the action that the pirate was to follow, and this action would be filmed. 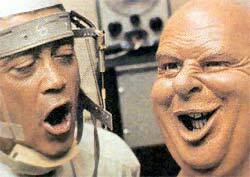 WED programmers then used the film as reference material to animate the Audio-Animatronics. WED described this innovative process by using the phrase "space age" in the 1970s, though the technology has improved since. While continuing to create the pirates, Davis decided to shy away from the bawdy truth of history, which typically included murder, mayhem, and venereal disease. He recalled his process of creating characters as being more fanciful than realistic: "The pirates finally used in the ride were mostly my inventions, since I moved away from the historical to create something more humorous." 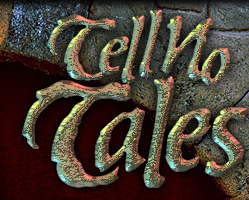 In an interview with "The 'E' Ticket" in 1999, Marc Davis described the design process from his point of view. "We built a model... set up like a walk-through. We made the model with openings where you could walk in and get a view of the scenes as if you were in the boats. That way you could get the effect of the staging of the ride scenes, and decide if they were going to work or not. I worked with Blaine Gibson and his people when they were scultping the little model figures." 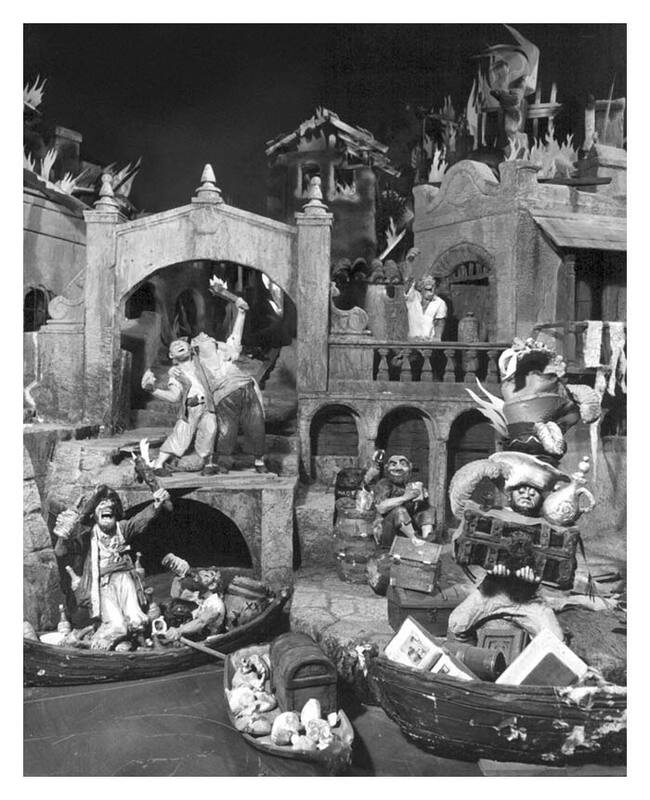 Disneyland issued a number of photos to the press in 1965, touting the upcoming Pirates of the Caribbean. Click here to download a sample photo.